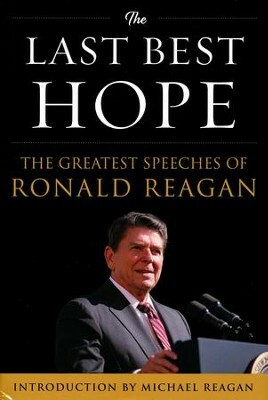 Designed for anyone looking for how to inspire and motivate, as well as history buffs and Reagan fans, this collection of The Great Communicator’s most important speeches features an introduction by Michael Reagan, photos, and helpful prologues that put each speech into the historical context. From the time he arrived on the political scene in 1964  throughout his presidency and beyond, Ronald Reagan  used his speeches to inspire and reinvigorate America. When he spoke, Reagan, said, he was preaching a sermon.” The American people saw his vision of America and his dreams for the future and they overwhelmingly responded; he was re-elected in 984 by the largest number of electoral votes in the nation’s history. Here in this collection of twenty-eight speeches spanning the Reagan era, readers can find inspiration in Reagan’s sermons.” From his first speech in the political arena in 1964 to his Last Letter to America, informing Americans of his Alzheimer’s disease, Ronald Regan’s words show a profound belief in God, freedom, individualism, limited government, and his great love for his country. In addition to an introduction by Reagan’s son, Michael Reagan, each speech features an informative introduction which puts the speech into historical context, making The Last Best Hope the perfect entrée into the influence of one of the major figures of the 20th century. "Reagan was a man of great ideas. The Last Best Hope celebrates the man and his vision for America." I'm the author/artist and I want to review The Last Best Hope: The Greatest Speeches of Ronald Reagan.